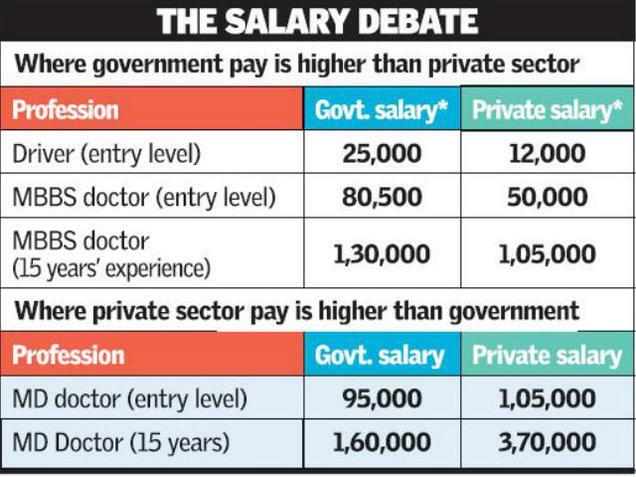 Lower-ranked Central government employees draw significantly higher salaries than their counterparts in the private sector but in the upper tier the reverse is true, says an IIM-Ahmedabad study commissioned by the Seventh Pay Commission. The ‘Salary Comparison Study’ conducted in October 2015 examined 40 professions, including nurses, teachers, scientists, electricians, drivers and clerks. It found the salaries of gardeners, clerks, receptionists and drivers lower in the private sector. For instance, a driver in the private sector typically earns around Rs. 12,000 a month, while an entry-level driver in government service earns around Rs. 25,000, including additional benefits and allowances. Even qualified professionals working with the government at the entry level are paid more. Government doctors with an MBBS degree get Rs. 80,500 a month while their counterparts in the private sector are paid only Rs. 50,000. The private sector, particularly in later years, pays higher to highly skilled professionals such as engineers with expertise in niche technologies, as they execute critical roles and are difficult to retain, says the report. Qualification and experience matter the most in the health care sector. Doctors with an MBBS degree in the private sector draw Rs. 50,000 per month at the entry level as compared to Rs. 80,500 in government job. But private sector doctors with an MD or MS degree and 15 years experience are paid much more – Rs. 3,70,000 per month as compared to Rs. 1,60,000 in the government sector. This indicates a higher valuation of doctors with advanced skills in the private sector as well as a scarcity of specialists, says the report. The study also found wide variations in salaries within the private sector, primarily because of the size of organisations, location, and profitability status. For example, in private schools where the recommendations of the Sixth Central Pay Commission are followed, the salaries are comparable to government sector, but in other schools the payments are lower. Most young men and women in India aspire for secure and high-paying government jobs, said Dr. Sonalde Desai, Senior Fellow at NCAER and professor of sociology at the University of Maryland. “But these jobs are not easy to come by and reservations for SC, ST and OBCs make it seem like a prize that is kept out of the reach of people from general categories,” Dr. Desai told The Hindu. She said this is one of the reasons why “we see an escalation of demands from groups like Jats, Gujjars and Patidars to be allowed into this golden circle of reservation”. Professor T.T. Ram Mohan from IIM-Ahmedabad said government salaries may be seen as an antidote to the enormous inequalities created by the private sector and also as lending an upward bias – however slight – to payments in the private sector. “In government jobs, the ratio of the top pay to the lowest pay must be within a certain band (12-13:1). No such consideration applies in the private sector, which is why inequalities have widened in all societies,” he said.